Do you hold Reliance Jio SIM? 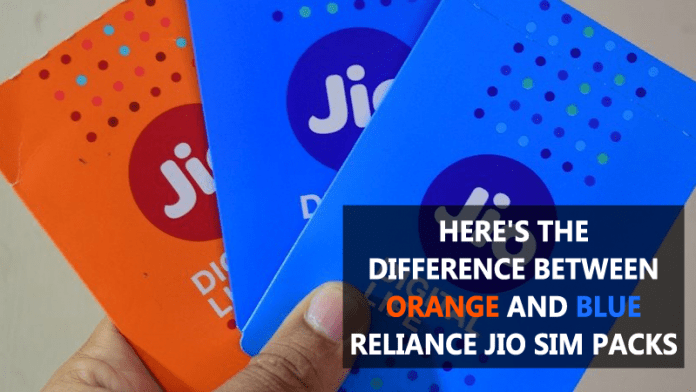 If yes, then have you ever imagined the difference between the Orange and Blue Reliance Jio Sim Packs ? We must agree that Reliance Jio had completely changed the telecom market, Jio is offering the plans that no one even imagined! Reliance Jio aims to offer high-speed mobile Internet to the 90% of the Indians along with the free voice calls and messaging services. By the end of the year, 2017 it will be open for all the consumers which were expected to be starting from the month September. Reliance Jio promises that the data transfer speed of their 4G network will reach up to 135Mbps. With this promise, the Indian market has gone crazy and anyone can witness huge crowd in front of Relianceâ€™s Digital store or Xpress Mini store. If you are one of them who waited in line or went through your own difficulties to obtain Reliance Jio free Sim card, then you might notice that some people have received different SIM Packaging than yours. Actually, there are two types of SIM cards that have been given to the customers, one comes with Orange colored Packaging and the other one is Blue Colored Packaging. So, what is the reason behind changing the colors of packaging ? If you received an Orange Colored packaging it means that you got one of the older SIM and the SIM is the part of Reliance Jioâ€™s Preview offer which is unlimited in all section like calls, Internet, SMS etc. The sim comes with its own number and users canâ€™t port-in their existing mobile number. The Blue Colored packaging is also same but comes with a significant change. The blue colored packaging is a part of Welcome offers, that is also unlimited in every section. However, the welcome offer only provides 4GB Daily High-speed internet after 4G of usage the speed will be dropped up to 128kbps. The Blue Colored Sim card is supposed to be used for Mobile Number Portability. The Blue Pack Sim is generated online through eKYC process which activates the sim within 5-15 minutes. If you are planning to get an Orange version of SIM cards then forget about it. You will not only get Blue Version because Orange Pack SIM cards might have run out of stock.